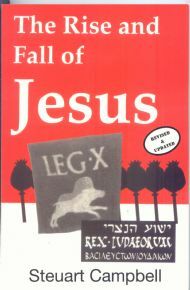 A book about the life of Jesus. Did he really exist and, if he did, what was he really planning? You'll find all the answers in this book, answers never revealed before. Also see how Christianity began--by mistake! You'll be astounded. Do you want to know the real story of Jesus? Did he even exist? Did he intend to found the Church? Did he rise from the dead? Was he the Son of God? In fact how did Christianity originate? Here's a story that's more interesting than the traditional one, but it gives no comfort to believers. I reveal that Jesus had a plan that has its origin deep in the Old Testament and which was intended to enable him to replace Caesar and rule the whole world. It is not a plan that was understood by his disciples or by the evangelists, who turned his failure into an apparent success. This was first published by me as 'Explicit Books' in 1996 (no other publisher was bothered). It is now out-of-print but copies can still be found on the internet. A revised and updated edition was published by WPS (WritersPrintShop) in June 2009 but is no longer available from them. A new edition will appear shortly. Freethinker (May 2000) by Jack Hastie. By Eric Stockton at http:www.users.zetnet.co.uk/BOW3741/gs981109.html (11 Jun 2007) [website no longer found]. ﻿See also the anonymous review placed on my Amazon book page. I wrote this book because I could. I was brought up as a Christian, but not by my parents (they thought that sending me to Sunday School would just make me good). After rejecting Christianity in 1970, I had accumulated a lot of biblical knowledge but was left with the question; if Jesus was not who he claimed, then who was he and what was he doing? Also how did Christianity actually begin? To answer those questions, I had to read many books on Jesus' life by non-believers or historians of Christianity. This showed that, although many authors, especially Albert Schweitzer, had glimpsed the reality behind the myth, none had put all the clues together, to see Jesus' full plan. Because I could see that plan, I just had to write about it. Because there have been so many books about Jesus, almost every conceivable title has been used, some more than once by different authors. But I wanted a title that had not been used before. Surprisingly, no one had used the one I chose.